Experience is the best teacher: let’s try a Kinomichi-inspired, Alexander Technique-infused movement experiment and explore our inner guides’ potential! When I give you that instruction what’s your first reaction – to shoot your arm straight up like a schoolkid with all the answers? To swing your arm forward or to the side in an arc? To feel your shoulder tensing or lifting to raise the arm? Notice whatever it is that you do in performing this movement. Try it a few times to get to know your usual pattern, without judging or trying to change anything. Come back to resting and let any excess tension flow out of your shoulder, arm, wrist, fingers – any place in your body that you might be holding on to the movement. Now imagine your fingertip is attached by a string to a helium balloon (the friendly presence of the title character in The Red Balloon, for example). Allow yourself to take the time it takes to use a minimum of tension or effort as you imagine the balloon moving your arm. The balloon slowly elevates your softened fingers, then hand, until your whole arm is extended/suspended over your head. Imagine the balloon rising up, leading your fingertips, lengthening your arm and lengthening your whole body as your feet rest on the floor. Your fingers are soft, your wrist is soft, your arm is soft, your neck is soft, your back and legs are supporting you with as little effort as possible – this is how you allow yourself to extend even a little bit further than you anticipated. Do you notice a desire to make yourself longer, to use extra effort to stretch? Although it may seem counterintuitive, all that work that we want to add to this movement – our expectations of how it should happen – may actually prevent us from achieving our maximum length, a length we may not have known we could attain. 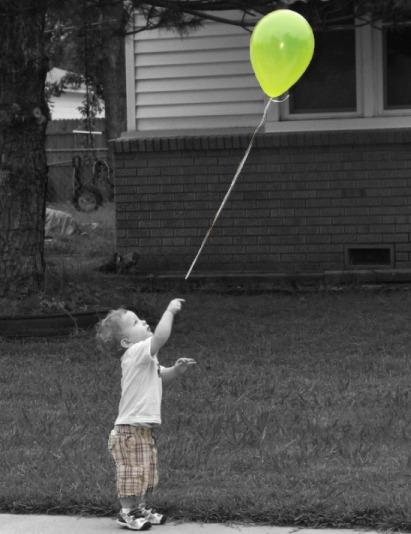 Let your imaginary balloon be a stimulus for a different movement experience. As you allow your arm to float back to rest, do you notice any differences between your arms? Any differences between the right and left sides of your body? To bring yourself back into balance, play the game with your other arm. What’s unique about how this arm wants to move? Are you expecting it to be like the first arm? As much as you can, let go of the expectation that the second arm will move the same way as the first. Find out what it’s like if you treat this as a whole new moment for exploration. Up the ante: extend both arms overhead - at the same time or one joining the other. Devise your own exploration. See the glimmer of a new path yet? In my next post we’ll explore how this open, patient state could inform a daily activity, like brushing your teeth or playing the flute!